Our trip started out with a tour of the Maker's Mark distillery, a place that is deeply rooted in tradition, family values, history, and a passion for making the best bourbon possible. Our tour was lead by Kevin Smith, who is the Master Distiller there. 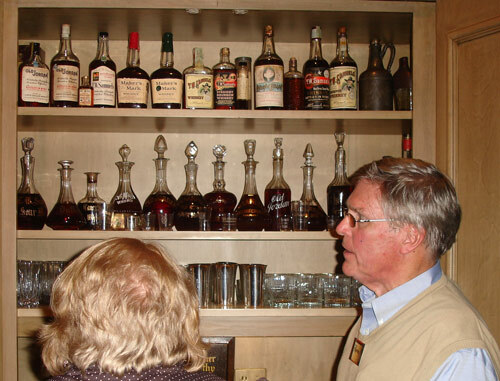 He led us through the ways that make bourbon special, including a trip through the rack house where we were able to compare the differences between different ages. Later we got to dip our own bottles of Maker's Mark and I am told if you have six drips of the wax then you did a good job - luckily mine had the requisite number and so if the whole writing thing doesn't work out I am qualified for a job on the bottling line! Later that night we were privileged to have dinner at the home of Bill Samuel's, the head of Maker's Mark, where we had a wonderful meal and got to see his collection of antiques including a pistol from Robert E. Lee, a voting machine from the vote that ended prohibition and of course several special bottles of Maker's Mark including the first bottle. The next day we headed on over to the Jim Beam distillery for another perspective on bourbon. Where Maker's Mark is more like a craft brewery that focuses on making small batches and taking extra, time consuming steps to make the product unique, at Jim Beam, it is much more of a manufacturing enterprise. That isn't to say that Jim Beam isn't a fantastic bourbon also, but simply a difference in philosophy and they produce huge batches each year and are the leading bourbon distiller in the world. Our tour of Jim Beam was lead by Fred Noe, who is a seventh generation Jim Beam family member and like his dad, Booker, he is the Master Distiller. The Jim Beam distillery does not currently offer public tours, so this was a huge honor - not just to have a tour, but to be lead by someone so intimately familiar with each and every nook and cranny of the distillery. They have recently erected a small visitors center and have plans to build several other additional buildings over the next few years to give guests a portal into how Jim Beam's bourbons are made. 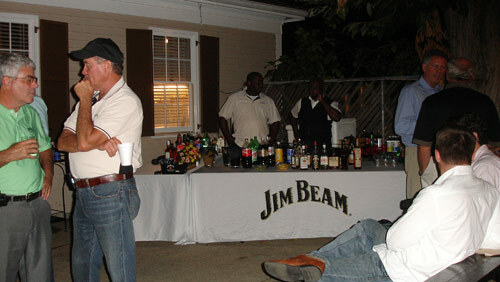 That night, Fred invited us to his house for Bourbonque where we were treated to music, fantastic BBQ, and a tasting of the Jim Beam small batch bourbons, including my favorite Booker's - which is 130 proof but has so much flavor that you almost don't notice the high alcohol content. On day 3, it was time to check out the Bourbon Festival, so we began our day with a delicious pancake breakfast - complete with ... you guessed it! Bourbon butter, bourbon syrup, bourbon coffee - and if I was ready to start drinking at 9 a.m. I am sure someone could have provided a flask of bourbon to drink too. Unfortunately shortly after we arrived at the festival it started to rain and so I didn't get to spend a huge amount of time, but I did get to see the Bourbon Barrel Races. Bourbon Barrel Racing is sort of like watching an inter-company softball game. The people who work at these distilleries are definitely a very close nit group of people and as each team competed against the clock it was clear who worked where as they cheered for their friends to get the best time. These barrels aren't light, so to see these guys roll them down the path and into the racks was pretty amazing ... even more so considering it was in the rain too! The festival itself is like many other festivals in that you have craft vendors, corporate sponsors, kids games, and demonstrations including a cooperage demonstration where I learned how bourbon barrels are made. Additionally, the major bourbon distilleries had booths where you could buy shirts, hats, glassware etc. That night it was time for the Bourbon Gala, which probably won't be on your mancation schedule, but since I was here with my wife, Heather from Chick Vacations it was a lot of fun and a completely unique experience. The black-tie gala started out like others that I have attended but before we entered the cocktail area, each guest was issued an empty cloth tote bag. Our first reaction was "what is this for?" but not to pass up a piece of swag we both gladly accepted it and moved into the cocktail area where eight different distilleries had setup shop - each with a special drink to share. Because they were our hosts, Jim Beam was our first stop. 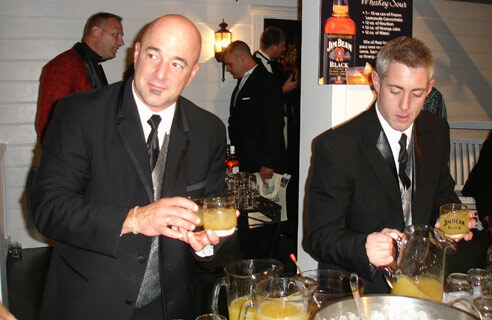 We grabbed a WONDERFUL whiskey sour and began to sip our drinks. When we finished we looked around and wondered where to return the glass - certainly we weren't going to wait in line to get back to the bar area. So we looked around and noticed that people were franticly dumping the ice from their drinks and stuffing their used glasses into the bags we all got. Could that be what we were supposed to do ... steal glasses and drag a tote full of glassware around with us the rest of the evening? Apparently so, as EVERYONE seemed to be doing that. So, when in Rome! The next 40-50 minutes consisted of a marathon sprint, and drinking experience as we went from one booth to the next trying to collect all eight glasses. I am happy to state that both Heather and I successfully collected one of each (plus a few extra wiskey sours!). Let me tell you though, that is a lot of drinking in one hour and the evening had just begun! Next we went into the main tent where we ate dinner, danced, and drank more bourbon - Booker's and gingerale is a GREAT drink! Sadly this was also the end of our trip, but we had a wonderful experience and one that I look forward to sharing with our readers in the spring. 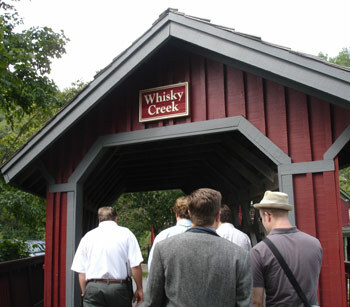 Even without all of the special events and priviledges, the Kentucky Bourbon Trail and the Bourbon Festival make an ideal mancation destination that I highly recomend to anyone looking for a way to learn more about this uniquely American drink, and experiencing the amazing hospitality of the Kentucky people. 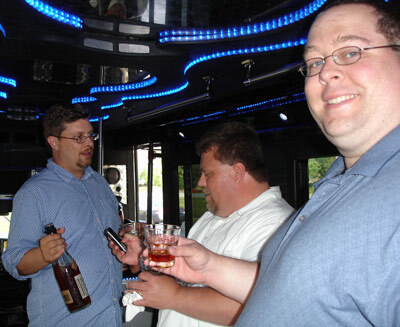 If you are interested in joining me next spring for a Man Tripping Bourbon Festival Mancation trip, let me know!